Indepth Water Management are experts in water pressure testing in Ireland. We carry out this test in the commission and maintenance of water mains for customers nationwide. We complete pressurisation using a variety of Hydrostatic Test Pumps. These are sized specifically for the type and size of pipe to be tested. 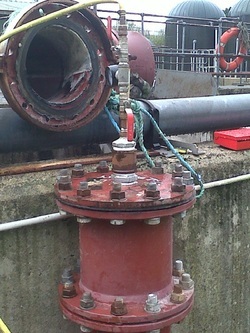 All pumps are pressure variable and fitted with pressure relief valves and set to the required test pressure on site. We test all “Creep Reactive” pipe materials such as HDPE, MDPE using pressure data loggers. Then our technicians download and interpret the logger results carried out on site on laptop computers. This happens immediately after the test procedure has been completed. We analyse test results using our WRC approved test programme and issue test certificates. We test solid pipe materials such as Ductile Iron or PVC using the water loss procedure and the standard certified test gauge and manifold. For more information on water pressure testing or any of our services, please contact us on 1890 77 22 22 or email us at info@indepth.ie. Or you can also reach us on our Contact Us page. We offer a 24/7 Emergency Call Out Service Nationwide.